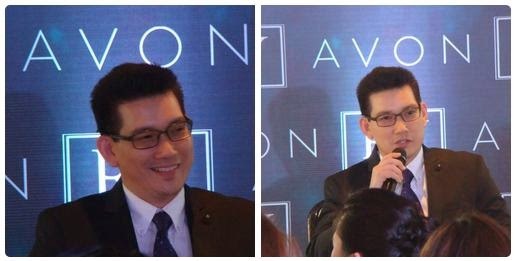 Avon formally announced Richard Yap as its latest celebrity endorser at today's unveiling of its newest signature scent, RY. At the event, the leading global beauty provider and number one fragrance brand in the Philippines, expressed pride and confidence in choosing the 47-year old actor and businessman to become the face of its latest scent. Delamar hosted the launch at The Blackbird, Makati Avenue in Makati City. "We are happy to introduce RY for all the men who want to exude Richard's charisma and to women who love their men and want them to feel and smell great," said Emie Aguilar-Nierves, Acting General Manager of Avon Philippines. "We are very thrilled in welcoming Richard Yap to our family," she added. "Richard is an inspiration for many as a celebrity, businessman and family man. We look forward to our Avon representatives meeting him in our sales events. Avon's Fragrance category Manager Carmina Decene further relayed, "RY reminds us women of a man whom we fall in love with despite the many contraindications---arrogantly confident yet full of charm, formal yet approachable. Successful, charming and debonair, he embodies the kind of man they dream of." RY also happens to be Avon's first ever signature scent for Men. And Richard Yap expressd gratitude in being the first Filipino brand ambassador to be given such honor to mark this milestone in Avon Fragrance. RY Richard Yap Eau de Cologne 75ml (P 900.00) is a fragrance that every woman would want to give her man. This light, woody scent exudes the personality and charisma of Richard Yap. Get a bottle now from your Avon Lady or visit www.avon.com.ph to find out how to get in touch with an Avon Representative near you.